I sell fine imported jewelry, from Bali and India and have a passion of finding one of a kind unusual sterling silver jewelry. 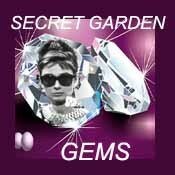 In 2009 Secret Garden Gems launched a virtual journey through its world at www.secretgardengems.net. all alike. All accessories are handcrafted and imported, made of solid sterling silver. Handcrafted gemstone jewelry by nature are rarely identical to each other. This variability is what makes each piece unique and interesting. We write actual descriptions and take multiple, super-sized photos to show you the details of individual pieces. We do our best to represent our stones and jewelry accurately. Sometimes because of the flash used in the photography or enlarging the photo or settings of computer monitors there are possible slight variations in the color. Our pictures are always of the actual item you will receive. Please read the descriptions and look at all the photos carefully before placing your purchase. It is our pledge that you will receive the exact item that you purchase. If there is a problem with your order, please contact us PRIOR to leaving feedback - your satisfaction is important to us! SecretGarden doesn't have any items in their booth! I purchased a lovely Sterling Silver Designer Bracelet from Secret Garden and love it!! Very high quality items and excellent prompt service outstanding! A+ great asset to Bonanza! Teragatto! This is such a special person, gives so freely of her time and is very patient with those of us who constantly ask her questions! I do appreciate her. SecretGarden rocks! She’s been so generous with her support while I settle in. Thanks chicka! Glad to have found Secret Garden in my search! No doubt, she’s a great seller! I admired her willingness and helpfulness! There’s so much in her booth that I love to buy that I will never be able to attend to my own booth! Many blessings and more business! SecretGarden is truly a cut above most sellers. Beautiful eye for extraordinary jewelry, she is a true professional in her field. Amongst the Bonanzle community she readily gives of herself daily. I am new to Bonanzle. Met Secret in chat. She has been so kind, sweet and helpful. Such a wonderful and fun person. And I LOVE her shop!!! High praise for Secret Gardens. She is such an asset to this community and goes above and beyond here. I’m thankful to call her friend. A great Bonanzler with a faboulus selection of items and wonderful asset to the Bonanzle Community. Secret Garden is such a wonderful asset to Bonanzle. Her booth is full of the most beautful and unique jewelry and her lovely & professional personality is a pleasure, for sure. very kind and helpfull seller..great asset to bonanzle.happy selling. Secret Garden is one of Bonanzle’s most involved and helpful leaders. The hand that she has extended to me as another seller is phenomenal and we’ve had a lot of fun, as well. She is professional and although I’ve never bought from her, nor she from me, I wouldn’t have any doubt that would go well also. Really Sweet Bonanzler, Really Beautiful Items in Her Booth! Honest and professional seller that always goes above and beyond to help others. A privilege and a pleasure to know her and an asset to Bonanzle. Best Wishes! Great Bonanzler, with real unique items for sale! Thanks for NOV birthday PR0MO wishes> Anyone dropping POSiTiVE energy my waY = definitely deserves my individual PERS0NAL eND0RSEMENT ~ Please take a moment to visit membersâ€™ ( SecretGarden ) b00tH nextâ€¦MONTR0Se approves this message!